Sales skill training shouldn’t just be about practical selling techniques. It should also include the way you create rapport and build a relationship at each stage of the sale. That’s very true in sales, and if you want to get the best results from your sales pitch then you need to know ‘How to say it’ at each stage of the sale. 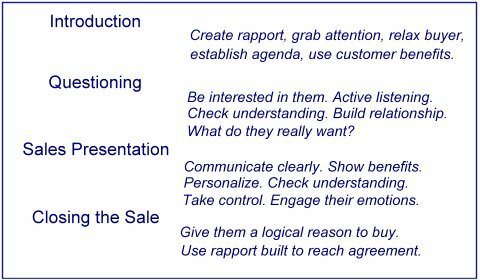 You must know what the relationship with the buyer should be at each stage, and how to create rapport that’s effective. Do you ask your sales questions in the same way that you give your sales presentation? Probably not. You have a different attitude, a change in the relationship, and you use an appropriate communication style. See ideas and sales skill training on this page that will show you how to communicate, how to build rapport, and how to increase your sales. The image above shows a simple sales process and the stages the sale moves through on the path towards closing the sale. On the right side are the rapport and relationship building elements of each stage. You may already be familiar with using an effective sales process. If not, or if you want more sales skill training on the stages of a sale, take a look at the sales training on using a Sales Process. Having sales skills training shows you the practical skills for each stage of a sale and how to build your sales stages. Once you can do that you then want to add rapport building and communication skills to make your sales skills more effective. So let’s look at each stage of the sale and how to create rapport with your customers. To make a great start to your sales you want to be friendly, sociable, and expressive in your sales introduction. You are looking for common interest with your prospect. These can be work related or personal. Still keeping a professional image you should be cheerful and a delight to be with. Build a sales introduction that adds a vibrant personality to well selected words. If you want help choosing what to say in those first few minutes with a prospect open Sales techniques for introductions. A common mistake from people that need sales skill training on creating rapport, is to let your friendly sociable side come out too late in the sales meeting. It takes confidence to let your true personality show through with someone you have just met. Because of this many people show their sociable friendly personality only once they have been talking for a while with the prospect. There is a really effective sales training tool that you can use to prepare yourself for a sales meeting so that you’re in the best state right from the sales introduction. 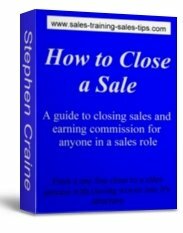 It’s called the sales Need-to-Close Chain and my team have found this a great tool to use. You can see more on Need-to-Close Chains and how you can use them for sales introduction preparation. After your sales introduction you use a caring attitude while you ask the buyer questions about their needs. Your tone, body language, and choice of words, should all contribute to encouraging the prospect to give you real information. The sales skill training for this sales stage is to show you care about the customer’s wants, needs, and desires. Knowing what to ask, what you need to know, and how to ask the questions, will get you the detail of the benefits the buyer is looking for. This is more important than just the features of the products that the buyer wants. If you create a good rapport the buyer will be more honest with you. Let them know you are not going to pounce on every buying signal they show. Getting all the information about their needs will benefit both you and the buyer. Take a look at the page on Questioning techniques to see how to select the best questions and use the sales skill training here to ask them in the best way. Your sales presentation should be direct and clear, and tell the prospect exactly what you can do for them. If you have followed the sales skill training on this site on how to ask questions you should have a list of the needs, wants, and desires the buyer is looking to gain. The sales rapport you have built so far now takes a more direct form of communication. Now you take control. You use a more assertive form of words, body language, and tone. You still keep the rapport you have built, but now you present information in a direct style. Be precise. Keep it simple. Make it easy to understand. You can see more on the practical sales skills of presenting at Sales presentation training. There you will find the right words to use with the sales rapport building tips you have here. Your sales presentation should be about passion and emotion. By building rapport you create a way of carrying the buyer with you to experience the feelings of having what you can offer. Gain as much agreement as you can while still creating rapport. Then follow up with a concise closing of the sale. Use detail and logic to close the sale and give the buyer a reason to go with their emotional buying decision. Now you take your sales rapport with the buyer to a logical level. With sales skill training and practice you should move from your emotional sales presentation to precise detail about price, features and benefits they will receive, and the formal information that may be part of your sale. They have agreed to your emotional presentation. This could have been in sections or to the whole presentation. Now you want formal agreement, the order, a signature, or payment. Closing the sale should form part of your presentation. To see how you can do that while still keeping that sales relationship open Closing the deal and see how to close a sale the easy way. Many sales people make the mistake of treating objection handling as a separate part of the sales process. Look back to the diagram of the sales stages above. 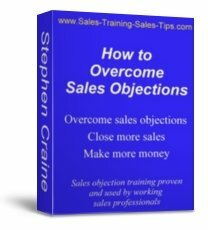 The simple way to overcome sales objections is to go back to the sales questioning stage and work through to the close again. Ask the questions, present the solution, and close the sale. On the practical side there is one more stage you can add that will make your sales closing more effective. You can see that at Sales objections sales skill training. Your rapport building should follow the same path as you did first time around. A friendly relaxed questioning stage. A direct emotional presentation and agreement gaining. And a direct precise close. The perfect sales pitch is when you combine practical sales skill training with creating the right sales rapport. Now you have an idea of the rapport you should be creating at each stage of the sale. You can see that the sale starts with a sociable introduction that uses your personality. Then you move into a friendly questioning stage, followed by a direct sales presentation where you take control. You finish the sale with precise detail handling and cold confirmation of the emotional decision to buy. Now you know how to create rapport, and what type of relationship you should have at each sales stage, you can build an effective sales process. I’m a working sales manager. I have developed sales skill training on building the sales stages that takes you through a set of exercises. The exercises show you how to build each stage in your own words. This allows you to add the right level of rapport building at each stage of the sales process. The training comes in a workbook format and you can start using it today. All the training has been proven by my working sales teams. These are professional sales people that use this sales training everyday to earn their living and keep their jobs. To see what this course can do for you now you know about creating rapport in your sales, open Selling Success sales training course or click the image. To start a new search for more sales skill training move to the main page of the sales skills section and click around the topics. You’ll find all the practical aspects of sales skills, the sales process, and how to close a sale. Open Sales Skills main page and see what else you can add to your sales training. The website has sales training, free information and sales courses, and pages on all aspects of selling. It covers the whole sales process from prospecting to appointment making, and the selling techniques that lead to you closing the sale. See all the topics and click around the links by moving to the Sales Training Sales Tips home page and start learning more ways to earn commission.